For other uses, see Pole (disambiguation). A geographical axis of rotation A (green), and showing the north geographical pole A1, and south geographical pole A2; also showing a magnetic field and the magnetic axis of rotation B (blue), and the north magnetic pole B2, and south magnetic pole B1. A geographical pole is either of the two points on a rotating body (planet, dwarf planet, natural satellite, sphere...etc) where its axis of rotation intersects its surface. As with Earth's North and South Poles, they are usually called that body's "north pole" and "south pole", one lying 90 degrees in one direction from the body's equator and the other lying 90 degrees in the opposite direction from the equator. Every planet has geographical poles. 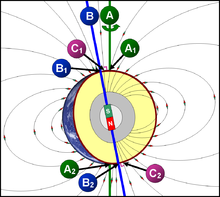 If, like the Earth, a body generates a magnetic field, it will also possess magnetic poles. Perturbations in a body's rotation mean that geographical poles wander slightly on its surface. The Earth's North and South Poles, for example, move by a few metres over periods of a few years. As cartography requires exact and unchanging coordinates, the averaged locations of geographical poles are taken as fixed cartographic poles and become the points where the body's great circles of longitude intersect. Wikimedia Commons has media related to Geographical poles. ^ Kotlyakov, Vladimir; Komarova, Anna (2006). Elsevier's Dictionary of Geography: in English, Russian, French, Spanish and German. p. 557. Retrieved 22 June 2015. ^ Hooper, William (2008). Aether and Gravitation. p. 224. Retrieved 22 June 2015. ^ "20 Things You Didn't Know About... the North Pole". DiscoverMagazine.com. 2014-11-18. Retrieved 2015-06-26. ^ Schar, Ray (2010). Wonderfully Weird World. p. 106. Retrieved 22 June 2015. ^ Lovett, Richard A. (2013-05-14). "Climate Change Has Shifted the Locations of Earth's North and South Poles". Scientificamerican.com. Retrieved 2015-06-26. This page was last edited on 15 April 2019, at 05:16 (UTC).